The outstanding performers from the first legs of the CAF World Cup play-offs. Goalkeeper: Charles Itandje Cameroon set-up defensively with a colossal back four and muscular defensive midfielders. They subsequently failed to fashion many chances in attack, but were resolute in defence. The Carthage Eagles still managed to sneak a handful of chances in, the best of which fell to Ben Youssef and Chikhaoui. Itandje was there to snuff out any of the threats the Tunisians procured as he hung on for a valuable away clean sheet. Right-back: Serge Aurier The 20-year-old further cemented his place at right-back in the Ivorian starting XI with another tireless, swashbuckling workshop of what is expected from a modern full-back. If he keeps this up, we may never see the defensive indiscipline of Emmanuel Eboue in Ivorian colours again. A fear lingered that the defender’s lack of regular football since his summer move to Rizespor will have Saladin Said eating him in the hostility of the Addis Ababa Stadium. But he proved his doubters wrong with an assured display all afternoon which included a goal-line clearance. Many remain unconvinced by the self-proclaimed Maestro’s ability as a centre-back, but he went some way to ensuring that they acknowledged why Sabri Lamouchi has deployed him there. Faced by a triumvirate of Papiss Cisse, Moussa Sow and Dame N’Doye, he did some brilliant blocking and right-place-right-time anticipation of danger. For his first match in charge, Ruud Krol certainly took a brave decision by playing Yassine Mikari over the experienced Khalil Chemmam. Chemmam, who is the ES Tunis captain, is more of a defensive presence and a set-piece virtuoso. Mikari is much more dynamic and pacey, in fact, he was recently deployed on the right wing for his club FC Luzern. The attacking gamble paid off for Krul, as Mikari put in an admirable shift and was left alone by the absence of Cameroon wingers. The Chelsea midfielder’s demise may have been exaggerated and Ghana’s need for him underestimated. Essien anchored the Ghanaian midfield to perfection, utilising all his big-game experience to protect an embryonic defence behind him. 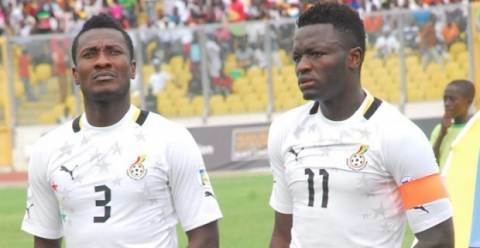 Involved in three of the six goals in Ghana’s dismantling of Egypt, the midfielder was pivotal in the resounding victory as he played with placidness and intelligence. Partnered in midfield with his good friend Michael Essien, he ensured the newly-formed Ghanaian backline was that little bit less ropey. Al Jazeera used the Jonathan Pitroipa song as they played a pre-match video montage of Burkina Faso’s prior qualification campaigns. At first, I thought this was unfair to the other Black Stallions. But after the match I understood what Jonathan Pitroipa meant to the Burkinabeé people. He was their talisman; their ‘chouchou’. Sure Charles Kabore and Bakary Koné are remarkable players in their own right, but Pitroipa put the nation on his back as he was at the heart of every dangerous attack. 1 goal and 1 penalty won in a scintillating performance for the Rennes man. If Pitroipa is in Burkinabé hearts, Feghouli is knocking on the door of Algerian ones. Performance after performance the Valencia ace has given 150%. His passion for the jersey is second to none and that is quite endearing to see. He was also very sharp on Saturday morning as he grilled Lingani and scored a crucial away goal for Les Fennecs. The man reborn in Rome delivered another very good performance, as has now become the norm for club and country. Involved in all three goals in Ivory Coast’s win, Gervinho was particularly outstanding in the first half as he tormented Senegal’s right-back Lamine Gassama with his frightening pace and direct running. The captain led from the front in every sense of the phrase, setting the tone for the afternoon with a goal after just five minutes. With Abdul Majeed Waris alongside him, he seems far more liberated and, despite being just 27, increasingly entering into legendary territory for the Black Stars. Honorable mentions: Ben Cherifia, Daniel Opare, Madjid Bougherra, Asrat Megersa, Kwadwo Asamoah, Yaya Toure, Charles Kabore, Yassine Chikhaoui, Abdul Majeed Waris, Emmanuel Emenike.